Catherine, at Reading to the Core, is hosting Poetry Friday this week. and take care of your heart. I have worked hard to help my boys find those people. and take care of their hearts. And now I am having to take that advice myself. This weekend life kicked me in the teeth hard. when they come from people you don't know. Who are not supposed to love you. when they come from people you know. The people you are supposed to love. The people you are supposed to be able to trust. And then you have to go to your real "family." to have the pieces put back together again. Tonight I have book club. Almost a month later, I'm still wrapping up my CYBILS reviews. Today's book is another novel in verse. RED BUTTERFLY, the debut novel of author A.L. Sonnichsen, is the story of Kara, an eleven-year-old girl in China. Kara has a limb deformity, a malformed hand, that caused her birth parents to abandon her. She lives with an elderly American woman, whose visa expired long ago. The Chinese government will not let the only mother Kara has even known adopt, because of her age, and so the two live a secret life, closeted away in a tiny apartment. The woman's husband and adult, Jody, live worlds away in Montana, and Kara wonders why they cannot visit or move there. Jody comes to visit and suffers a medical emergency, which causes the family to be discovered. In the second section of the book, titled "Dissolve," Mama is deported and Kara ends up in an orphanage, where she is befriended by a physical therapist (whose name I failed to include in my notes- sorry!). Most of the children in the orphanage have much more intensive physical challenges, such as cerebral palsy and spina bifida, and Kara ends up helping, and befriends several of the children. Kara's Montana family is not allowed to adopt her, because of their age. Eventually, she is adopted by a family in Florida, who has several other children adopted from China. Kara has difficulty adjusting to her new life, away from the only mother she has ever known, and I love that this book does not sugar coat how hard that adjustment period really is. 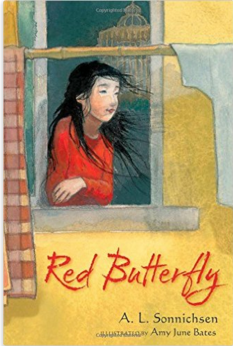 Upper elementary and middle school kids will enjoy this story, as will adoptive families. I know I did! Not quite a month ago, I wrapped up a stint as a first round judge for the CYBILS poetry category. This year, for the first time, novels in verse were included under poetry, and there were a lot of great ones, I think around 15. 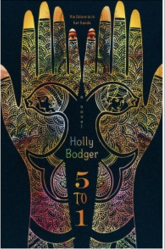 Today's offering, 5 to 1, by Holly Bodger, a dystopian story, is told in two voices, part novel in verse, and part prose. The year is 2054. In India, where gender selection has gone on for many years, there are now 5 men for every one woman. A group of women, tired of the inequality, have somehow managed to wall off an entire city and create their own country, Koyanager. Men in this city/country exist for one purpose-- to serve women. "Boys are taught only useful things. Things that will help them serve the women in Koyanagar." Woman in Koyangar select their husband through a special process, that feels, to me, a little like THE HUNGER GAMES. Five men are involved in a series of contests. The winner of these contests becomes the lucky husband. Losers are sent away to serve as wall guards for Koyanagar. Sudasa, whose story is told in verse, is an unusual young woman. She does not want to select a husband this way. Feels more like a cage. She is even less pleased to learn that somehow, her contest has been fixed, and a cousin that she doesn't even like, is included in her five choices, intended to be her husband. Kiran, another one of Sudasa's five choices, whose story is told in prose, is also more than a little unusual. When I was about to turn fifteen, I got up extra early so I could finish my chores and then listen to every minute of the tests. But after a few months, they all sounded the same. Different girl, different boys, but the rest: same same same. And still, the people here today have swarmed like flies to a rotting corpse. Someone should tell them they’re a bit early. The corpses come after the tests. Kiran has plotted with his father to lose the contest, and then somehow escape from Koyangar. I thought the ending of the book would be predictable. I expected Sudasa to defy her family, and select Kiran. The two would then fall in love and live happily ever after. It seemed a given. You will have read the book yourself to see whether that really happens. the mistakes we’ve left behind. This book seems perfect to hand off to THE HUNGER GAMES/TWILIGHT crowd. Tara, at A Teaching Life, is hosting Poetry Friday today. So I'm kind of wondering if I might be losing my teaching mind??? I have always thought of myself as someone who demanded, and got, a lot out of kids, but lately I'm really beginning to wonder. It has to do with this thing we are calling "rigor." Because I'm kind of feeling like there is a fine line between rigor and ridiculous. And somehow, I think we have crossed it. I look at the kids I teach. They are seven or eight or thirteen or fourteen. They read-- picture books and chapter books and graphic novels and poetry and social media and text books-- all the time. They seem to be developing as readers. But then I look at the texts/passages we are asking kids to read on tests. And mostly, they seem ridiculously hard. Two or three or four years above what I would expect kids that age to read and understand. And I question whether this is really developmentally appropriate, really necessary. And I look at the questions kids are being asked to answer. Minutiae. Teeny, teeny twists in language that separate the correct answer from the closest distractor. And I think of the English Language Learners I teach. And I question whether this is really developmentally appropriate, really necessary. And I look at what we are asking kids to write. Forget personal narrative, or response to text. Kids are presented with at least two relatively long passages. Asked to compare point of view, or character change over time, or literary techniques. Often in a 45 minute time frame. And I question whether this is really developmentally appropriate, really necessary. I watch our third graders, who have only just learned to keyboard. Watch their faces scrunch as they think. Watch their hands stretch as they attempt to type. And I question whether this is really developmentally appropriate, really necessary. I look at the way some of the test questions are constructed. And I wonder whether they are really measuring kids' reading and writing abilities, or their computer savvy. And whether we can really count one or two or three questions as an accurate measure of a child's mastery of a standard. And I question whether this is really necessary. I wonder about all of this, but when I open my mouth to ask questions, people look at me like I'm a heretic. Like I don't expect enough out of kids. And I feel like the child who is pointing out that the emperor is wearing new clothes. Our kids' first day back after vacation. making my presence known enough to avoid potential disasters. An ordinary day until she throws up on my feet. I am walking by her table. Often she sits with three or four girls, but today there are just two of them. Her friend gets something in her eye and leaves for the bathroom. J asks if I will stand there with her until she comes back, so she won't be alone. since I loaned her lunch money the first day of sixth grade. and a date, only a few months past. who died from a brain tumor. in a kind of love/hate relationship. and helped with science fair projects. Some days she likes me, and we are best friends. badmouths me to her friends. if she had a good vacation. And she throws up on my feet. She tells me that it was her birthday. and doesn't want J around. and sits on the table between us. Hurt, raw and deep, flashes across her face. I did not know there was a dad in the picture. or broken up with their boyfriends. I know what to say about dead pets. after they have made a stupid mistake. But today I don't know what to say. I tell her I am so sorry. Offer a story about one of my sons. And the father that isn't there. about 15 minutes away from ours. throw up on your feet. I'm still reviewing CYBILS nominees. Today's offering WONTON AND CHOPSTICK by Lee Wardlaw, is a sequel to WONTON, a story about a shelter cat and the boy who takes him home. Wonton and Chopstick is broken into chapters, just like the original. In the first chapter, WONTON has become very comfortable in his routines. Nap, play, bathenap, eat, repeatpractice makes purr fect. One day, he senses something different in the house. A new puppy has come home. And the adjustment is a little difficult. The Surpriseputhimoutputhimoutputhimoutputhim-- waitI said him, not me. Eventually Won-Ton and the intruder become co-conspirators. You shouldn't rummagethrough the rubbishbut what's doneis done so…Let's eat! And of course, ultimately they become friends. Your secret revealed.What kind of name is Basho?I shall call you…Friend. Sweet, predictable, one that the little guys are sure to ask for again and again. * I'm not sure why, but Blogspot is being difficult today and won't let me do line breaks. My apologies to Lee Wardlaw! "Delicious. Ridiculous. Funny. Engaging. 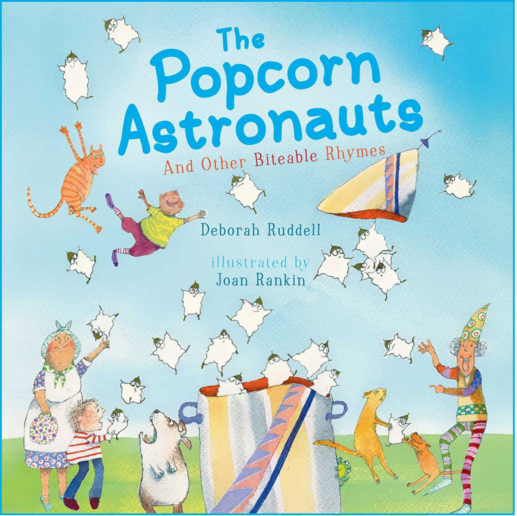 Popcorn Astronauts offers a variety of “edible” poems that are as strange and crazy as the book’s title. For example, try a shake ordered to poetic specifications: “A frosty cup of moonlight, please … As mushy as a mittenful of slightly melted snow ….” If that is a little on the chilly side, then try “Dracula’s Late-Night Bite,”especially after he “flosses his fangs and he slides out the door for dessert.” Great poems to cause both laughter and interest in young readers and examples for writing one’s own delicious verse." and eat them while they're hot. "A frosty cup of moonlight, please"
and pearlier than polar bears,"
For reviews of the other six finalists, go to the CYBILS website. Tabatha is hosting Poetry Friday this week at The Opposite of Indifference. Pretty much every post I have read tonight talks about one little word. I'm embarrassed to admit that I haven't chosen one. And that I might not choose one. I can't remember what word I chose last year. I clearly didn't do a very good job living it, since I can't even remember what it was. I have thought of several words. The one that comes to mind over and over again is ORDER. Or ORGANIZATION. Both of those things are sadly lacking in my life right now. Last summer, I bought the TIDYING UP book that everyone seems to be talking about. I started it. Then I lost it. Then found it again. And restarted. I really want to be one of those orderly, organized people with a clean house and clean closets and a clean car and a clean garage. But I'm not there yet. I have also thought about BALANCE. I'm not very good at that either. For a couple of different reasons. I really love my job. And I love the people I work with. It really doesn't feel like work when you get to do something you love every day. But I definitely could stand to work a few less hours. I know I will work on my Spanish. But I don't have a word for it. BILINGUAL seems a very lofty goal, given my current state of Spanish. I have thought about CREATE. I'm really longing to do something artistic. Just not sure what. I have thought about taking a class in watercolors. That's something I have always wanted to do. I have also thought about taking a knitting class. But I think those would be a lot more fun with someone else, and I haven't found anyone to do it with yet. I want to redesign my blog. I tried that New Year's Eve, but I didn't get too far. And learn to create some of the fancy graphics that everyone else seems to know how to do. There are other words I could choose. PATIENCE? That would be a good one. Or what is the opposite of PROCRASTINATE? That could be my word. Or the opposite of WORRY? That's another one I could definitely use. I haven't chosen a word yet this year. I'm really not sure I will. 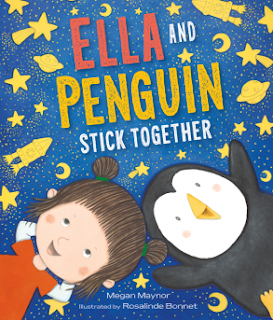 Ella and Penguin are good friends. It only makes sense, then, that when Ella gets a new package of extra special, glow-in-the dark stickers, that she wants to share them with her friend. The problem is, both Ella and Penguin are a little, ok, maybe a lot, afraid of the dark. And you can't really get the full effect of glow-in-the-dark stickers unless you go into a dark place. A sweet, sweet story about friendship and sticking together and facing fears. I love books that encourage kids to develop a fascination with words. 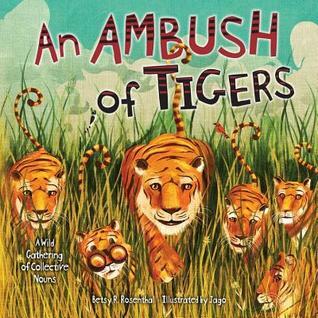 AN AMBUSH OF TIGERS is definitely one of those books. In this rhyming picture book, author Betsy Rosenthal presents collective nouns in a way that kids are sure to enjoy. Did you know that a group of tigers is called an ambush? That giraffes come in towers? Rhinos in crashes? Leopards in leaps? Sharks in shivers? Porcupines in prickles? There are thirty-three different animal groups for kids to enjoy. that snores in its sleep? Would you call it a mob? Back matter includes a glossary.